Over the years, banks experienced a metamorphosis from simple corner branches offering savings, checking and basic loans to mega financial entities offering investment products, mortgages, specialized lines of credit, investment banking and private banking. The dismantling of the depression era regulation, the Glass-Steagall Act, also known as the Banking Act of 1933, allowed banks, insurance companies, and investment banks the ability to enter into multiple business functions. Some economists believe that the loosening of these regulations that started in the mid 1990s may have led to the financial crisis of September 2008. For years banks basically made money from the interest earned on their loans and mortgages. 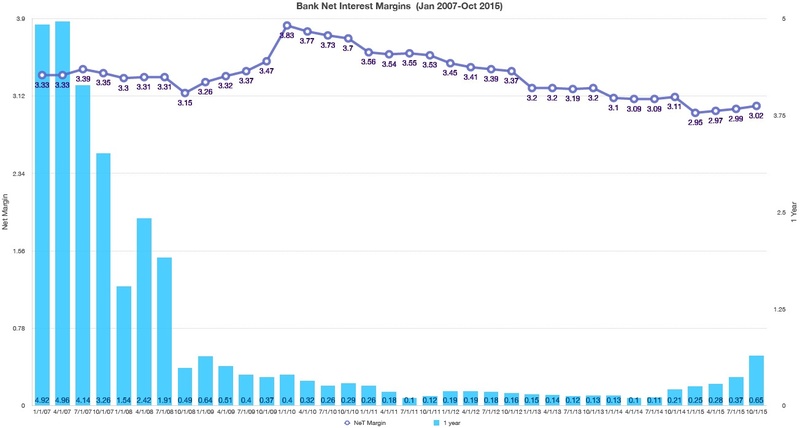 This interest earned by banks is known as net interest margin, thus greater interest rates essentially earned larger net interest margins. This formula was fine for years until rates started to drop. So as rates dropped, banks were able to earn less of a margin, the difference between what banks pay the federal government to borrow funds versus what they lend it out for to both retail and institutional customers.